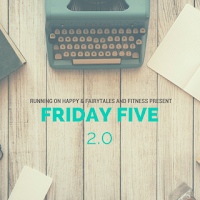 Ah, here we are at the last Friday of the month, meaning it's time for reflection, Runfessions, and the Friday Five 2.0! So here we go and I will try to make this post, "of the season." 1. I runfess that this has been a really odd Fall - we still have temperatures in the 80's here in Nashville. It's also been incredibly dry. That means that the normally extraordinary gorgeous Fall we typically get here in Tennessee, has not really materialized. Some trees are beautiful, but so many are just dropping their leaves. And I'm disappointed! It's doesn't FEEL like Fall and definitely doesn't FEEL like Halloween. 2. I runfess that the changing season has messed with my sleep. I find myself staying up later than I should and the dark mornings have completely turned me into a zombie. If you've ever watched zombie movies or TV shows, they don't really run, they stumble around. For those of us who try to be morning runners (even if it's not our natural inclination), stumbling around is a bad way to go about it! 3. I runfess that I've only really done one Halloween race ... and I didn't even do it in costume. It was during the "Twilight" craze though and a friend and I ran in shirts that said "I run with vampires." A ton of runners really love Halloween races and dressing up - does this make me a not fun runner? 4. I runfess that even in the final weeks and days before the New York City Marathon (ah! scary! ), I have over-indulged in the Halloween candy that has placed itself all over the office. My favorites that have been tormenting me? York Peppermint Patties, M&Ms, and Midnight Milky Ways. 5. I runfess that I am going to be really relieved when I'm done with marathon training. This isn't my first round of marathon training, but this one has been really difficult, more of a burden. It might have been the crazy hot and humid summer, but I'll be thrilled to get back to more "normal" mileage. I'm linking up with some of my fav bloggers who are hosting this week. Give them a visit! Thanks to Marcia's Healthy Slice, Fairytales and Fitness, and Running On Happy. I am not a huge fan of the chocolate candy. I prefer more of the gummies such as swedish fish, sour patch kids, and gummy bears...yum! I will have my first Halloween run of the season tmrrw. Looking forward to dressing up! Oh I do love some sour patch kids as well! Have an awesome race tomorrow - can't wait to hear all about it (including your costume! I won't lie--as much as I missed running a fall marathon, I didn't miss training in the heat of summer! You got this! Thanks Wendy! I used to never understand how people trained through the winter ... now I think it's really smart! We have fall colors here, but they're not as spectacular as usual. Overall fall was late coming and it's still going to be 75 here today. It'll be awesome for trick or treat but yeah, not seasonal. I think the warm temps are what help make us so unready for the Christmas holidays. I'm so excited for you and NYCM!!! And yes, I'll be thrilled to take a breather from hard training for a bit too. Ugh. THanks for linking up! Oh my gosh, I hadn't even thought about Christmas, but you're right! It's not THAT far away! I better get my shopping in order. I suppose trick-or-treat and Christmas shopping is better in warm weather. Just feels so wrong! Lindsay,Good luck with your final push to be ready for the NYCM. You can do it! There will be thousands of people there to cheer you on so make sure you have your name on your jersey. Enjoy Taper Town before you get to the big apple! Thanks so much! I have to say I think tapering might be my favorite part of marathon training :) I've heard great things about the crowd support in New York, so hopefully that will help push me through! I am running NYC next week, and I too am excited for training to be over. This is my second marathon this year and I feel like training is all I have done. I am definitely enjoying taper ! I have never run in a costume, too afraid of chafing ! Good luck next weekend! I'll be thinking good thoughts for you! I definitely feel like you do - like I've been in marathon training all year (which feels totally different than just running all year). I don't know how people do it who run more than two a year! See you in New York! I do love Halloween. The candy doesn't tempt me as much but I do like those Milky Way Midnights! I think our weird weather has been hard on everyone. I'm ready to turn my clock back next weekend so it won't be so dark until 7 am! I runfess that I have fueled for a race with candy bars ... Goo Goo Clusters to be exact! :) It's so easy to get off your game with running - we've all done it - but I know you'll get back to it!